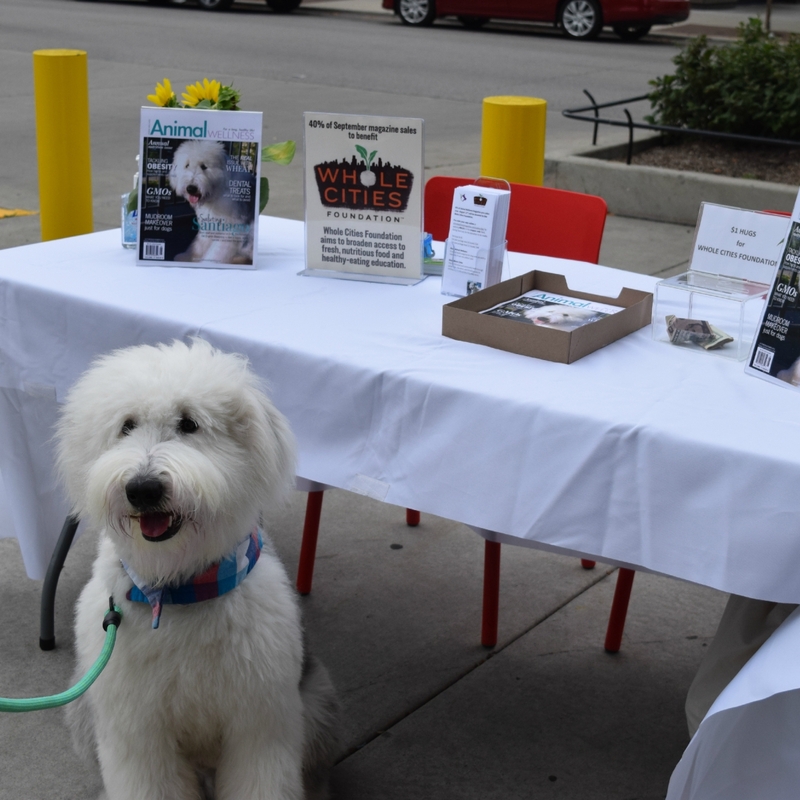 CHICAGO (July 27, 2015) – On Sunday, July 26, 2015, Santiago, the Old English Sheepdog, spent the afternoon giving $1 hugs and raised hundreds to benefit the Whole Cities Foundation. Santiago, or Santi for short, who will soon be featured on the cover of Animal Wellness Magazine, invited his 160,000 Facebook fans to come to Whole Foods and hug him to benefit the Whole Cities Foundation. The fluffy-socialite has previously raised funds for P.A.W.S. Chicago and participated in a benefit event for the Anti-Cruelty Society, but this time focused on giving back to humans. Santi, the kale adorer, takes nutrition seriously and decided that working with the Whole Cities Foundation was a no-brainer as it is dedicated to improving individual and community health through collaborative partnerships, education, and broader access to nutritious food. Santi’s cuteness and charity work has caught the media’s attention. The affectionate Sheepdog has been featured by Dogster Magazine and will be on the cover of the October-November issue of Animal Wellness Magazine, which is now available for pre-purchase. Forty percent of all pre-purchases (now – August 12th) will be donated to the Whole Cities Foundation by applying AWA251 in the coupon code field during check out. About Santiago: Santiago, the Old English Sheepdog, lost his mother and siblings at birth and was later diagnosed as deaf. Santiago overcame these hardships by focusing on obedience school and learning sign language. Santiago’s upbringing shaped him to be the most lovable dog in the world. When he is not riding in his bike trailer, hanging at the dog park, eating veggies or swimming, he is walking around Chicago, IL, making people smile.